Keizer students ask: When is enough enough? UPDATED 3/29/2018 3:09 p.m.: This story has been updated to reflect new information. Keizertimes is not divulging the scope of the change because it involves a minor. For students at Whiteaker Middle School, the events that led to student walkouts – a shooting at Marjory Stoenman Douglas High School in Florida – at schools across the country echoed in their own lives. 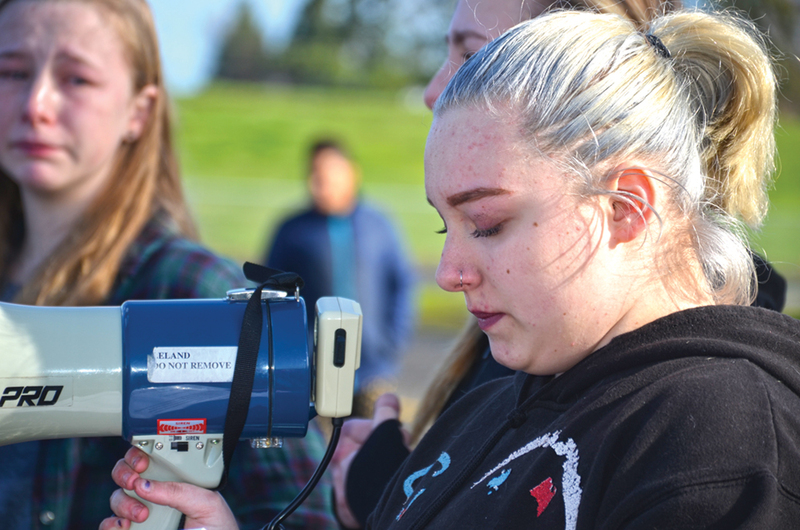 Students at both Keizer middle schools and McNary High School participated in student-led walkouts March 14 meant to memorialize the victims of the latest mass shooting at an American high school and advocate for change to make schools safer. Hodges joined three fellow student leaders in memorializing the victims over in the parking lot at Whiteaker. In addition to telling the participating students – maybe a third of the student body at the school – about her cousin, Hodges called on everyone at the school to do what they could to change the circumstances for students who feel lonely and alienated. “Think about what would have happened if people had been nice to him (the shooter). It might never have happened if people had listened to him when he needed it most,” Hodges said. Paris Boyd, another eighth grader at Whiteaker, led students out of the building and was the first to speak to the crowd over the megaphone. Boyd and the other organizers read obituaries and scoured social media to compile brief biographies for each victim of the shooting. After reading each name, the Boyd, Hodges and others described the interests and work of those who were killed. Asked whether they feel safe within Whiteaker itself, both responded they did, but with differing reasons. “As a student, I feel as safe as possible because we have great security and we have a teacher who served in the military. I feel safe here because of the people we have here,” Hodges said. “I feel like Whiteaker is a very safe school. My mom was worried because she heard some people were saying they were going to shoot kids during the walkouts. That made me worried, but I feel safe here and I want other kids to feel safe in their schools,” Boyd said. Hodges said she wanted the students who participated in the walkout to feel empowered after it was over. “I hope that they realize that it’s not only high schoolers. Some of us think we can’t say something because we are only in middle school, but I wanted them to realize that they can still have an opinion and a voice on these things,” Boyd said. More than 200 students walked out at McNary High School. They stood in silence for 17 minutes in front of the school. Danner walked out to show her support of Parkland and because she no longer feels safe at school. Students at Claggett Creek Middle School also filed out of the building at 10 a.m. and stood in silence for 17 minutes.